The web-based presentation application SlideRocket has enhanced its tools for interactivity and collaboration. Users can now incorporate interactive elements into their presentations, in addition to traditional graphics. For example, a presentation might include a plugin showing a real-time Twitter stream. In addition, one can include polls directly into presentations, as well as a commenting system, so that viewers can post questions directly on slides. One can also include audio narration. Users within an organization can have access to shared folders and libraries that they can use to put together presentations that are customized to a specific audience while retaining the organization’s graphic look and content. So, for example, if a salesperson uses a particular slide containing statistics and that data changes, it can be updated in one place; all presentations using that slide will be updated accordingly. Similarly, if a company changes its logo or graphic design, presentations can be automatically changed to reflect the new look. SlideRocket was one of the first services to be integrated with Google Apps (s goog); users can incorporate documents and spreadsheets directly into presentations. Existing presentations can be imported from PowerPoint and Google Presentation. The interface for putting together presentations is surprisingly simple and intuitive. 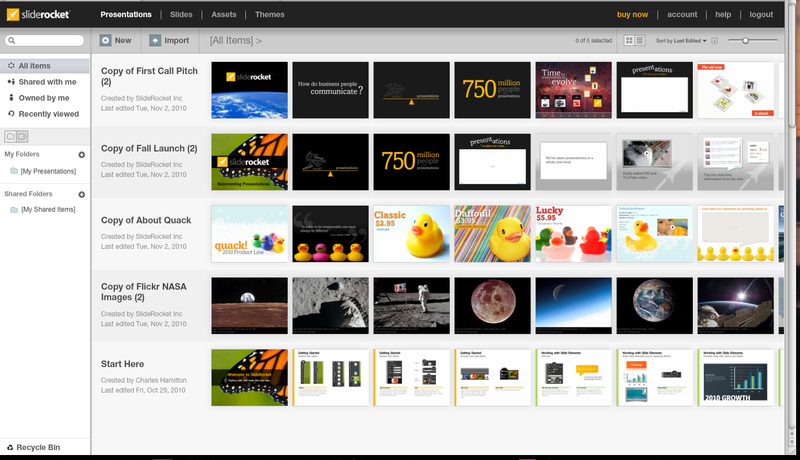 Without leaving SlideRocket, one can search for images through Flickr (s yhoo), or through its own library of stock images. Presentations can be made public, embedded into web pages, or can be shared with specific colleagues or clients. SlideRocket offers detailed analytics that allow tracking of who looked at what. And yes, presentations can also be printed or turned into PDFs; of course, interactivity will be lost. At present, SlideRocket presentations continue to be Flash-based (s adbe). However, the developer is preparing an HTML5 version that will be available on platforms, like the iPad, that don’t support Flash. You can see a sample presentation or a video. Pricing plans include a free “lite” version with limited features, a “pro” version for $24 per user per month, and an “enterprise” version that is priced per user. A 14-day trial is available. Google Apps admins can make the trial or full version available to their users through the Google Apps Marketplace. Do you use SlideRocket? What do you think?